This Bacati 10-Piece Nursery-in-a-Bag Crib Bedding Set 100 percent Cotton Percale Crib Bedding Set with Bumper Pad for US standard Cribs. This Bacati crib set adds a whimsical touch to your precious child's nursery. It comes with everything you need to welcome your new one home into his/her first bed, including a reversible comforter, crib skirt, Reversible Bumper Pad, one crib fitted sheet, diaper stacker, one window valance, three-piece wall hanging and a musical mobile with hanging toys to entertain your new baby. This nursery crib bedding set is easy care and provides the comfort your baby needs. All Fabrics used in making this bedding are 100 percent Cotton Percale Fabrics in signature Bacati - prints and filled with lofty polyester in comforter and long side rail guard cover. Cotton is good for your childs sensitive skin and is bio degradable too. 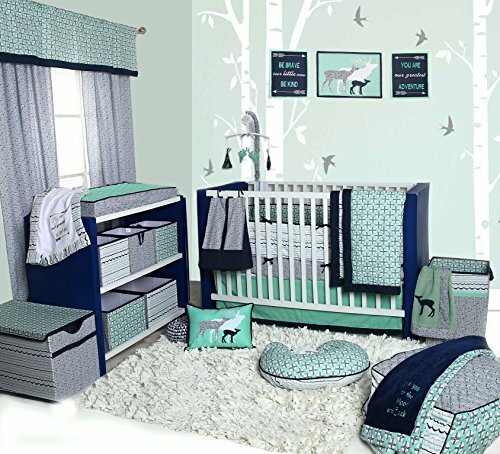 There are many other cordinating accesories to purchase separately in this bedding collections including multiple options of crib/toddler bed sheets, curtain panels, window valance, crib/toddler bed skirts, blankets, 10 pc crib sets with Bumper Pad, with One Long Side Crib Rail Cover, with 2 crib fitted sheets, 4 pc crib sets, 6 pc crib sets, kids storage including Nursery Storage Caddy, Hamper, Toy Chest, Storage Totes in multiple sizes, 4 pc toddler bedding sets, 3 pc toddler bed sheet sets, Decorative pillow, Memo Board, Baby Activity Gym, quilted changing pad covers, Nursing Pillow and Covers, Tee Pee, 2 pack short side crib rail covers, etc available to purchase separately from Bacati. Baby Activity Gym, quilted changing pad covers, Nursing Pillow and Covers, Tee Pee, 2 pack short side crib rail covers, etc available to purchase separately from Bacati.